U.S. airports are implementing the idea of replacing human guards with automated systems to detect and prevent exit-lane breaches. Those who have made the switch, report that automated airport security service systems improve landside-to-airside security and reduce ongoing operating expenses. TSA officials have been leading airports toward automated exit lane security and airport security doors ever since the agency completed an evaluation of the technology roughly two years ago. After determining that automated airport security services systems are effective against wrong-way security breaches, TSA announced that it could opt to not staff exit lanes in new or recently remodeled terminals. The TSA stated, “this will allow the administration to focus on its most critical responsibilities such as the screening of passengers and baggage.” “Exit-lane monitoring is not a screening function, but rather an issue of access control” similar to perimeter fencing and gates for vehicles. Isotec Security designs and engineer’s products and services, including airport security doors specifically to improve airport security while reducing their current overhead costs. Our airport security service systems prevent unauthorized access by those using false credentials, “piggybacking” or “tailgating”, and from entering secure areas through designated “Exit Only” areas. A posted security position at an airport operating 24/7 cost more than $150,000 annually. The chart below shows how $620,000 of cost savings is possible with an automated exit lane or airport security door in just 5 years. 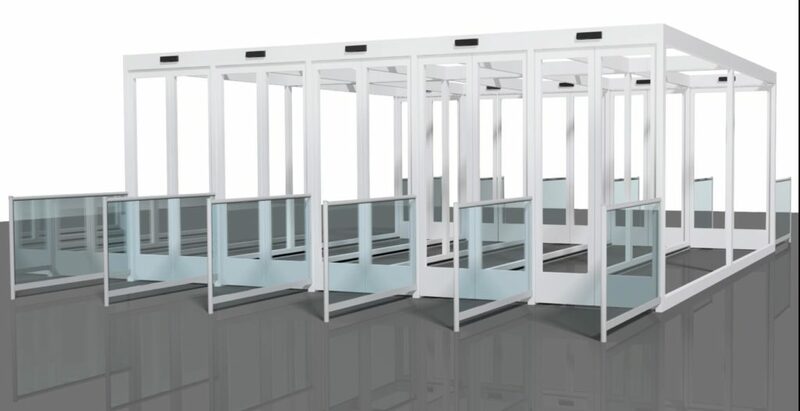 Automated interlocking airport security door systems provide access control to prevent, not just detect, tailgating, piggybacking and attempts to gain entry with false credentials. Isotec interlocking door systems are tailor-made for preventing these types of security breaches. Known crew member entrances are designed to deny unauthorized access to areas for pre-approved personnel. Automated Exit Lane Breach Control (ELBC) is achieved by the same interlocking door premise. Sensors, in constant communication with programmable logic controllers (PLC), activate security measures that deny access to secure areas from designated exits. As a subject matter expert on automated access control systems, Isotec Security received the Certificate of Designation from the Department of Homeland Security for developing and deploying Qualified Anti-terrorism Technologies. One of these technologies includes our highly efficient, top-quality airport security service doors. Call us today at (303) 974-7699 or email msamels@isotecinc.com for information.